Whats up everyone. I am new to he BMW scene and I am excited to do something with my newly acquired 318ti. I have done some motor swaps in all kinds of other cars including my current Audi. I got my 97 318ti 5 speed M sport package for $100 and all it needed was a battery and started up. The radiator was leaking so I bought a new one and It has been a champ ever since. The car Is clean as far as body damage is concerned. It doesn't have clear coat on the hood or roof is the main thing wrong. Also the front seat are in poor shape. Everything else works and is in clean shape. I have an opportunity to get a 328i auto with a bad transmission for a decent deal. I am thinking this will be a good doner car for a 318ti transplant. The car starts up and runs just fine. I do have a few questions that I have not yet been able to figure out. Will there be any issues using the Auto engine in my manual ti? I have read some conflicting things on this subject so I would like to get a straight answer. I will obviously need to swap the dme, ews, and key ring/key chip. Is that all plug and play? Thanks for looking and thank you for all the help! Auto engine is fine in manual car. The 328i harness will be auto though so you may need to cut a few wires/disregard some.The M44's Getrag will work behind the M52. Heck, even the 4cyl clutch would work for a short time. An M52 isn't a torque monster so depending on what you're using the car for the Getrag will last. I have a 300K Getrag that has spent the majority of it's life behind a 6cyl getting romped on the street and it has 0 issues. Now it's behind S52 with all the bolt ons and still no issues. I'll look at the wiring but there are a few threads that discuss that here and on BFC. I guess that was more of my question is what would I have to do to the wiring harness to get the auto engine harness to get it to work with my manual ti. Also will the cluster(from the sober car) read incorrectly if there is anything disconnected on the auto harness? My M52 came from an automatic car and went into my manual 318ti. The wiring diagrams are all available on the internet but the major difference is that the auto harness does not have a reverse light plug to go into the manual transmission. I was able to find the proper pins and wiring and I added that plug to my wiring harness. The big transmission control unit connector can be tucked inside the ecu compartment. Then the other auto transmission cables can be wrapped up and zip tied down near the side of the block. I've been running the getrag behind my M52 since the swap two years ago. Sorry for the late reply. I bought a full donor car today. A 99 323. So it has the m52b25 in it if my research serves me correct. Do you guys have any opinion on things I should do to it while it's out that I won't be able to accomplish with it in the car? It has a little oil leak but appears to run fine. I picked it up for $300 with a clean title. It's apparently beat up on the outside but the interior isn't too bad. From what I'm told at least. I'm in Houston for the next 4 weeks and won't even be able to see the car I bought until I get back to CO. I had my brother go pick it up for me. I'm working on the same swap, except I'll have to buy an engine harness + other stuff. The M52 aluminum motor I bought was stripped of lots of parts. Based on my research, here's what I'm doing while the motor is out: 1. Reinforce the front subframe. I bought the weld in kit. Follow their directions. We tried to bend the ear reinforcement ahead of time & it made everything worse. 2. Make sure the oil pump pulley nut is secured, apparently these fail. There's kits or you can safety wire it/weld on yourself. 3. Replace oil pan gasket, cause you have to crack it open to do oil pump pulley anyways. 4. I'm cleaning & painting the engine bay since it's easy access. 5. Refreshing the front end with new LCA's, bushings and a reman steering rack. Again just cause it's easier now. That's it, unless you want to do head gasket while it's out also. I'm sure you'd save on labor if motor was already out when it goes for machining. and make sure you have a decent radiator. The originals are known to fail. I was planning on buying an aftermarket radiator since I am going to delete the mechanical fan and run just the aux fan. I’ll probably do a refresh on the oil pan gasket and the valve cover gasket. I want to do head gasket and stuff too. I will be sure to check the oil pump nut. Do you have to reinforce the front end? I have read that it’s not needed. But would like more opinions on it. A 99 323 is going to be an e46. You ideally need an e36, unless you want the hassle of the e46 system. Unless you really want a front subframe reinforcement kit isn’t needed, let alone for this amount of power. It probably is a late e36. It’s definitly an e36. It might be a 98. I don’t know to be honest. I haven’t seen it yet. Just pictures and a video of it running. My brother picked it up for me last night and is storing it for me. He says we engine runs pretty smooth but the transmission slips pretty bad. 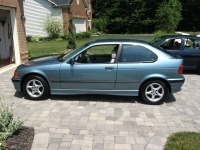 Which is good because I’ll be mating it to my stock 318ti manual transmission with upgraded clutch. Is there a write up somewhere on how to connect the reverse lights and build the new plug into the harness? The one thing I am not confident in is electrical work. If I have a step by step I can do it but reading wire diagrams is not my strong point. Will I need to have the Transmission control unit need to be in the car at all since my Ti is a manual? That sounds just easy enough for me to screw it up by over thinking it. Thanks for all the help. I am hoping to get this done when I get home from this 6 week training course for work. I am also going to order a new silicone intake elbow (with asc delete), Valve cover gasket, oil pan gasket, SAP delete blocks, new clutch and flywheel (the m44 one is not doing good), CDV delete, new cooling system with Aluminum radiator, lower temp thermostat, lower temp coolant sensor, metal thermostat housing, and Silicone hoses. I am probably going to try to get a m50 intake manifold and swap that too. Is there anything else you guys can think of while I am in there?